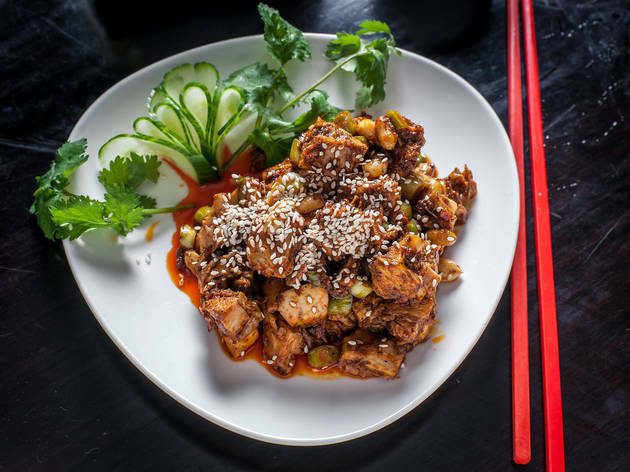 Known for his fiery Szechuan food and salty tongue, Taiwan native Han Chiang has earned a cult following in the City of Brotherly Love. 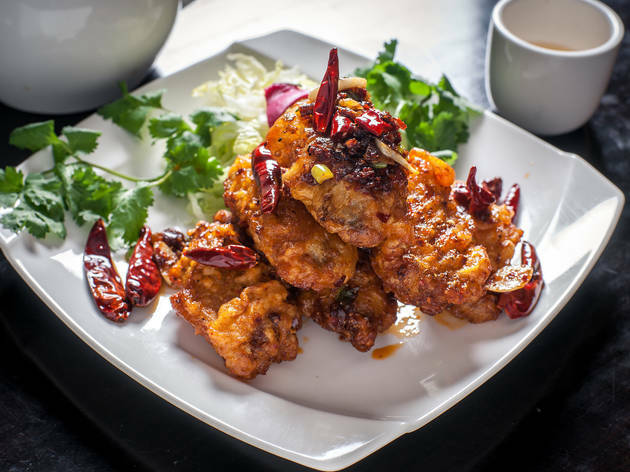 Perhaps the most beloved hometown franchise since the Rocky movies, his Szechuan chain, Han Dynasty, has made its chili-oil mark on Philadelphia, and has now marched into NYC. 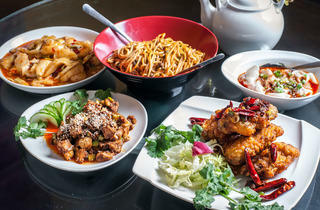 Its cheery yellow walls and Chinese oil paintings constitute thoughtful decor by Szechuan-restaurant standards. 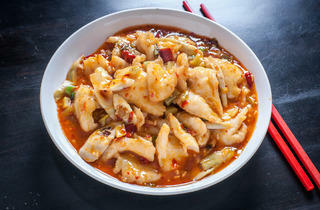 But what the hoodie-clad hordes are lining up for is the handful of Szechuan starters that run with this city’s best. 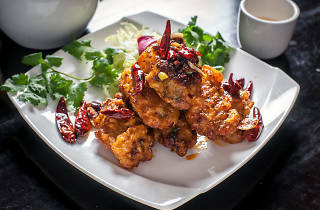 Monster spiced chicken wings ($9.95) are the new standard-bearers, batter fried until sublimely crunchy, their shredded chili heat surging but never engulfing. 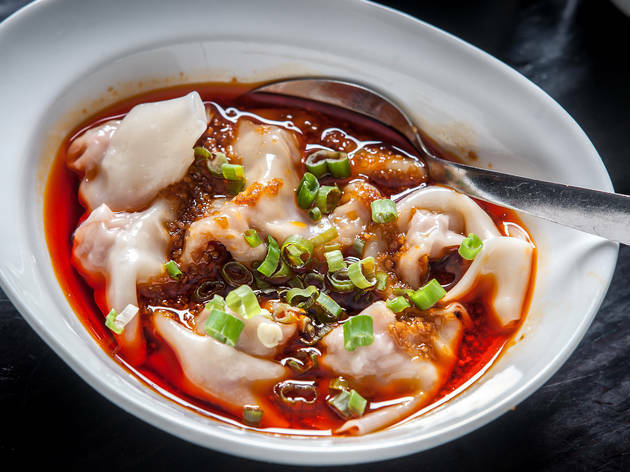 Chilled chunks of bone-in rabbit with peanuts ($9.95) and delicate pork wontons ($6.95) are a tale of two chili oils; the bunny’s intoxicates with its Szechuan peppercorn hum, while the dumplings’ soothes with the sweet balm of roasted garlic. 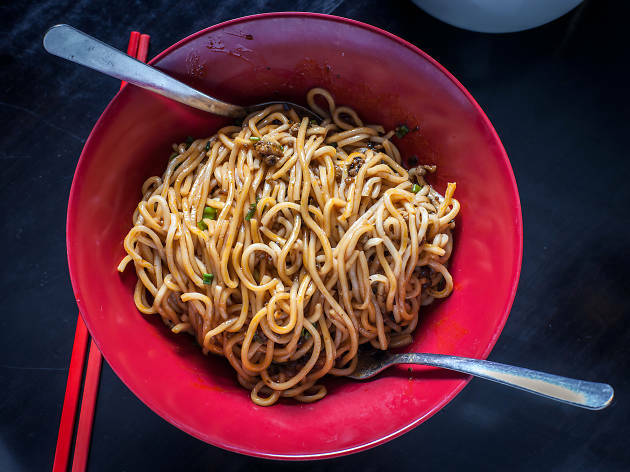 The much-talked-about dandan noodles ($7.95) justify the hype, springier than most and with a defter balance between throat-buzzing chili oil and mollifying sesame paste. 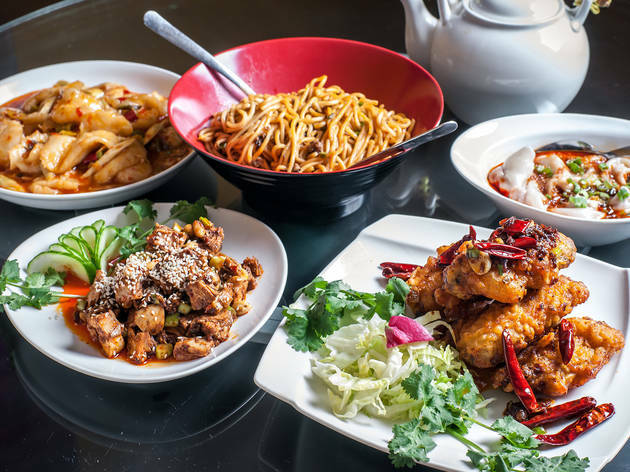 They’re tossed fervently at your table, sometimes by Chiang, who darts around the lively room, brashly recounting the ancient origins of his dishes like a pirate anthropologist with a penchant for the f-bomb. Whereas apps are stellar, entrées are mostly just passable; double-cooked pork belly ($13.95) is smacked too hard by salt, while stir-fried cumin lamb ($15.95) strikes only one earthy note, lacking both gamey funk and crackling crust. 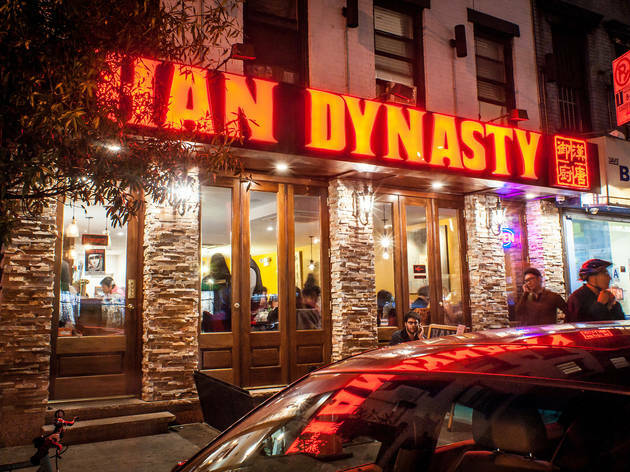 Yet even with a menu as top-heavy as a chicken-legged bodybuilder, Han Dynasty’s sizzling opening salvo earns it a spot in the NYC Szechuan rotation. Like Rocky Balboa, it lands enough punches to win. Behind the bar: There’s no hard liquor to be found, but at how many other Szechuan spots can you quench the burn with craft brews like Dogfish Head 60 Minute IPA? Vibe: Pop in to knock back some noodles at the eight-seat bar, or bring your chili-fiend friends and go all in for a chef’s-choice tasting menu (minimum of eight people, starting at $20 per person). Cocktail chatter: In an effort to show some serious brotherly love to NYC, Chiang has resolved not to raise his original Philly prices, despite lofty East Village rents. 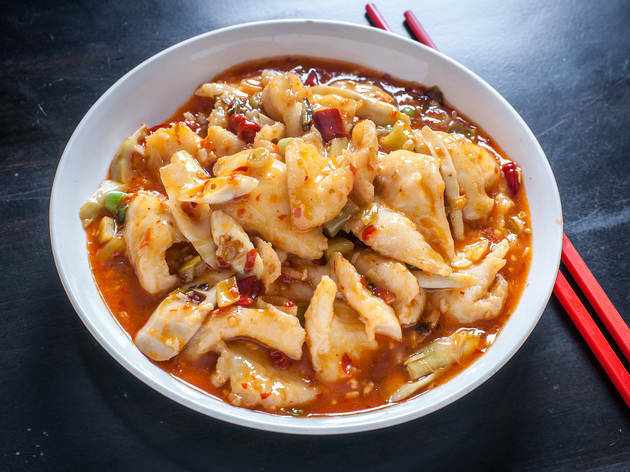 Soundcheck: If the revving ma-la combo of Szechuan peppercorns and chilies doesn’t make your head pulse, the clamorous din of the dining room will. When you want good quality (actually great) Chinese food and you don't want to test out anything on Seamless - ORDER HAN! On caviar! My standard order is the dry pepper chicken, the spicy cucumbers, and the don don noodles. If you try to dine it, it is literally a madhouse so just do yourself a favor and sign up for caviar. We went to the downtown location purely because it was more central to where we all lived (8 of us total, a group just big enough to make a reservation - woohoo!) and had an absolute blast. Loved the giant lazy susan in the center of the giant round table so that we could easily pass along dishes to share. Everything we had was DELICIOUS (including the infamous dan dan noodles, which live up to the freakin' hype!) I really don't think you can go wrong with anything you order. Cuz it's all really freakin' delicious. 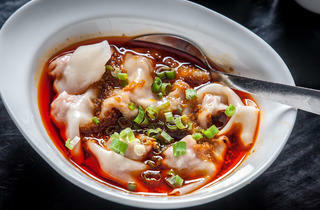 If you haven't been to this Szechuan spot originally from Philly, walk don't run! The Upper West Side location is spacious and gorgeous and the perfect place for Sunday dinner with the family. The food is insanely spectacular. 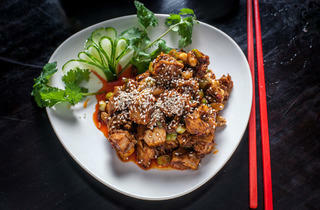 Don't miss the dry pepper chicken wings, spicy cucumbers and get a double order of the Dan Dan noodles. Did I mention that it's also affordable? If you want seriously spicy Szechuan that's swimming in peppercorns and mala, with no frills and at a low price, this Philly import IS IT. 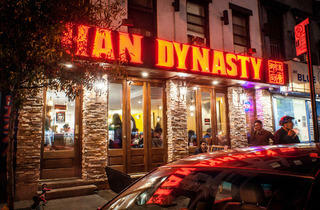 Takes the crown from all places in NYC and most in Flushing. Get the braised beef filets in chili oil with the cabbage. Insanely good. This is an indulgence for me whenever I find myself downtown. 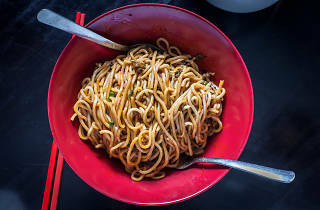 The Dandan noodles deserve all of the hype, while other dishes like the dumplings in chili oil and dry fry style entrees round out a delicious and flavorful meal.